Cajun Chicken Pasta – Spicy Cajun chicken tossed in yummy Barilla penne pasta with a homemade Parmesan cream sauce. Such a perfect dish for date night! A few months ago, my husband suggested that we set aside two Fridays a month for date nights. Just us, going out for a fun evening out on the town. Such an amazing idea! For at least two nights a month, we check out an awesome restaurant and even splurge a bit for a date night. But this month we’ve been eating out a lot so we decided to spend this Friday cooking together at home. I love when we get a chance to cook together. Usually it’s just him or I cooking dinner on a given night so its truly special when we get to do it together. One of our favorite dishes to eat out (and one of the few we equally enjoy) is Cajun chicken pasta. Have you ever had it? Many restaurants make it and they tend to have their own twist on it. It’s usually a Parmesan cream sauce with spicy Cajun chicken, perfectly al dente pasta, and a collection of vegetables, whether it be tomatoes, peppers, onions, or all three. So that’s we decided to make! I don’t usually gravitate to spicy dishes so “Cajun chicken pasta” is not typically something I would order. But when I was working as a hostess at a restaurant, I had the opportunity to try their version. And I absolutely loved it! The spiciness of the chicken is mellowed out with the creamy Parmesan sauce so I’m not drinking water every five seconds to cool off my mouth. But what I loved most was the collection of flavors. It had more depth than a fettuccine alfredo or any other pasta dish that I’d had up until then. Plus, how can you go wrong with pasta and cream sauce?! The great thing about the recipe is that you can switch it up to suite you and your tastes. You can use a mixture of chicken and shrimp, or chicken and sausage, or all three! But if you use sausage, no need to cover in Cajun seasonings since it’s already seasoned. When it comes the pasta, I’ve seen it made with all different kinds. We decided to use Barilla® Classic Blue Box Penne because of it’s ability to hold the sauce so well. See the ridges in the pasta? That’s exactly what they’re meant to do – grip the sauce. You may remember me declare my love for Barilla pasta in this post during the holidays. I use Barilla pasta for all my pasta dishes because of the quality of their pasta. You really can’t deny a pasta that is so well-made. You can find Barilla products at your local Kroger, located on the pasta aisle. If you two plan to cook this dish together, split up the tasks before you start. Maybe you’ll make the chicken and your significant other will make the sauce? That’s exactly how we split up the tasks. It reduced the total cook time since we able to cook simultaneously. Make sure to save your pasta water after the pasta has been drained. If the pasta sauce gets too thick, we’ll use this super flavorful water to thin it out. The first time I was told to do this, I was perplexed with the task: how exactly am I supposed to save the water if it goes down the drain?! Well, my friends, this is when your slotted spoon comes in handy. You will simply scoop out the pasta from the water and place in a medium bowl until the rest of the components (i.e. chicken and sauce) are ready. Leave the hot water in the pot on the stove (with the heat off) until we need it. When I’m making a cream sauce like this one, I typically like to cook it in the same pan that I used to cook the chicken so that it gets all that added flavor. However, Cajun seasoning tends to be a lot spicier and even saltier than just salt and pepper. So if you cook your sauce in the same pan, your sauce may be too spicy and/or too salty. That’s why I recommend that you use separate pans. Yes, than means one more thing to clean but it’s worth it. Trust me – I’ve made this mistake before. Usually, when I see that a recipe calls for fresh parsley, I see this as a suggestion and not a requirement for the dish. Not here, people! I highly encourage you to add the 2 tablespoons of fresh, chopped parsley to this dish. With all the heavy cream and Parmesan cheese in the sauce, you can really use the fresh flavor from the parsley. Plus, it adds gorgeous, little green flecks all throughout. I hope you are inspired to stay in for your next date night. Or even for this upcoming Valentine’s Day! I assure you that this dish will make the perfect meal for you two to enjoy. Make sure to cap off the romantic evening with one of these milkshakes or this chocolate raspberry mousse! For more ideas on how to make pasta “Wonderful Your Way,” check out the awesome collection of pasta dishes you can make with help from Barilla, including some more date night ideas! Add Cajun seasoning and 1 tablespoon of olive oil to large plastic zipper bag and mix together. Add chicken and toss to coat. Add remaining olive oil to medium skillet and heat to medium high. Cook chicken until cooked through, about 6 minutes each side. Place on a plate and cover with foil. Bring a pot of water to boil. Add about 2 tablespoons of salt to water and then add pasta. Cook until al dente. Scoop out of water with a slotted spoon and into a large bowl. Cover pasta to keep warm. Keep pasta water in case we need it for the sauce. In a large skillet, melt the butter. Add garlic and cook until fragrant, about 1-2 minutes. Add lemon zest and then gradually whisk in heavy cream. Let cream cook until it begins to bubble. Add Parmesan cheese and stir to combine. Let sauce thicken for another couple of minutes. If it gets too thick, add a little pasta water to thin it out. Give the sauce a taste. Add salt and pepper, as needed. Add tomatoes and toss to get them warmed up. Add pasta to skillet with the sauce. Slice chicken into bite-sized pieces and add to pasta. Add chopped parsley and toss everything together. Top with a few more tomatoes, parsley, and cheese for garnish. Serve immediately. That looks SO delicious! Cajun pasta is one of my favourite dishes and I always order it when I see it on a menu so I now I can make my own! chicken breast and not just chicken? Good callout! I’ll update now so there’s no confusion. Thanks! I love Cajun Chicken pasta!! I also like to make it with shrimp. Both are so good!!! Now I need to go make some! We love to spend date nights in and cook for each other. This looks exactly like something we’d make, too. It looks so yummy, and I love that it’s not overly spicy. This looks delicious! Plus, it sounds easy enough to swap out the chicken for meatless alternative, I may have to recreate this 🙂 Always looking for nice date night fare to serve at home! Okay! This recipe looks delicious. I want to eat if for breakfast. LOL Thanks for sharing. This is one of my absolute favorite dishes!! Seriously so yummy. I love how easy your recipe is also. Looks great!! This looks really good. Your pictures are great too. Haha yesssss! I am right there with ya, girl! Love this pasta! it looks beyond delicious, I might actually make this tonight instead though!! Needed a dinner idea, thanks for sharing!! Yup, I’m going to have to pin and make immediately! Thanks for sharing! It is a special treat when my husband will make dinner with me. It takes a bit of extra time (lol), but it is fun! Yay! So happy you have something new to try! This dish looks fantastic, I really love a good pasta dish, I will have to give this one a try! Give me all the pasta! No seriously IM on a huge pasta kick and this sounds delish! I love your date night..what an awesome idea. And i have been wondering how else I can cook my pasta. thank you for this recipe.will pin it for my cooking plan. Yay! So glad I could help spice up your meal plan! Saving the pasta water to even out the thickness of the pasta sauce is brilliant! I never would have thought of that. Cajun and spicy everything are my favourites, this looks so good. Can’t wait to try it! Thanks so much! I learned it from the Queen of Italian cooking – Giada Di Laurentis. So easy but it accomplishes so much! 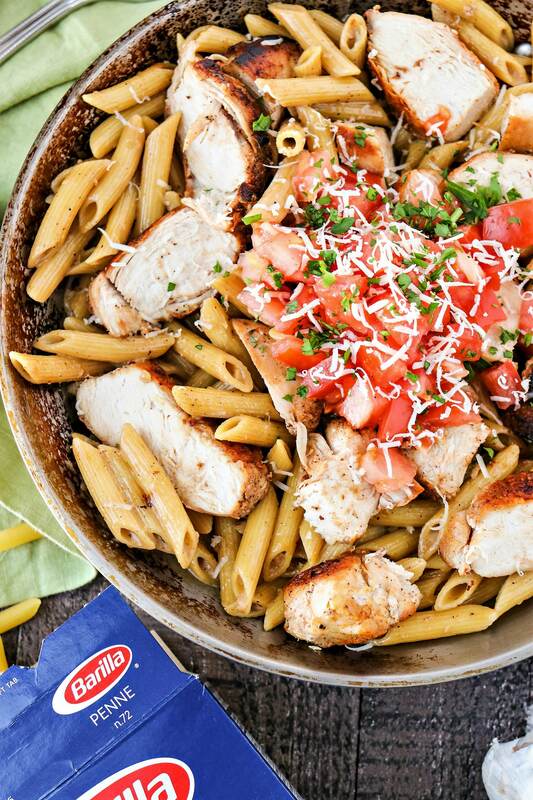 I actually never had cajun chicken pasta before but this looks really good! I think II’ll make it with some roasted chicken this weekend! Thanks so much! Using roasted chicken is a great idea! Sounds delicious! Plus a fantastic idea for date night when you’re staying in! Thanks so much! Let me now how you both like it!